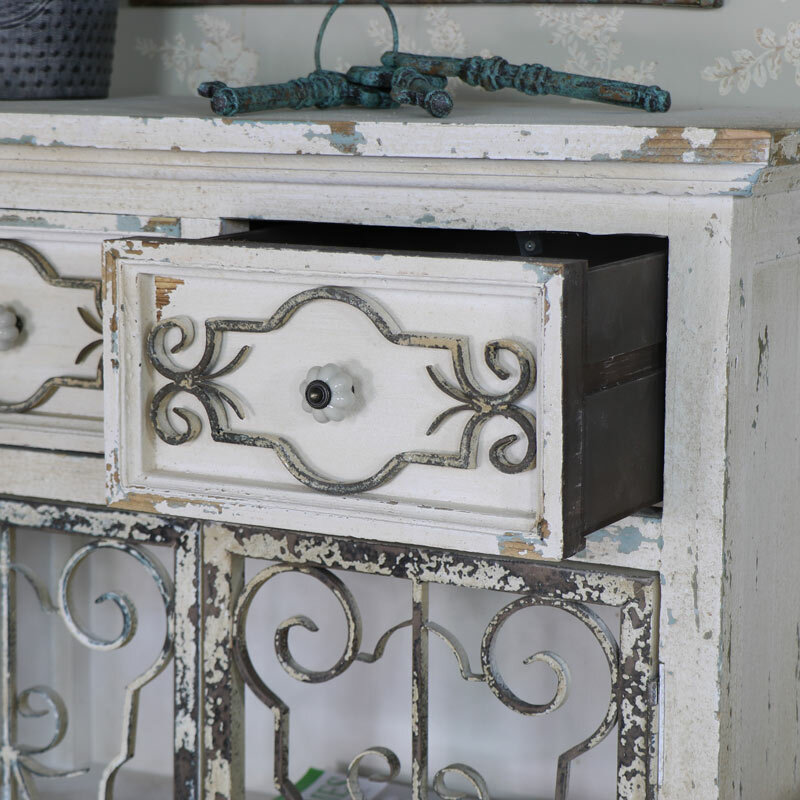 Add some shabby chic style to your home with this gorgeously rustic sideboard. Great storage in a vintage look that is perfect for the living room or hallway. A stylish cabinet with 2 drawers and cupboard underneath. 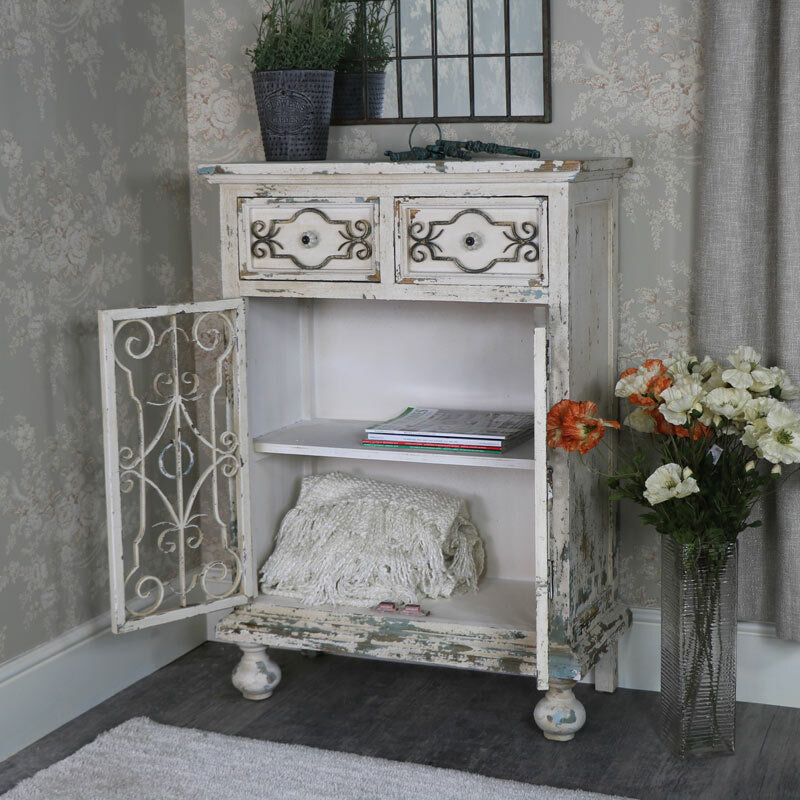 The cupboard features an open metal fretwork design that complements the rustic charm and adds a loved homely look. 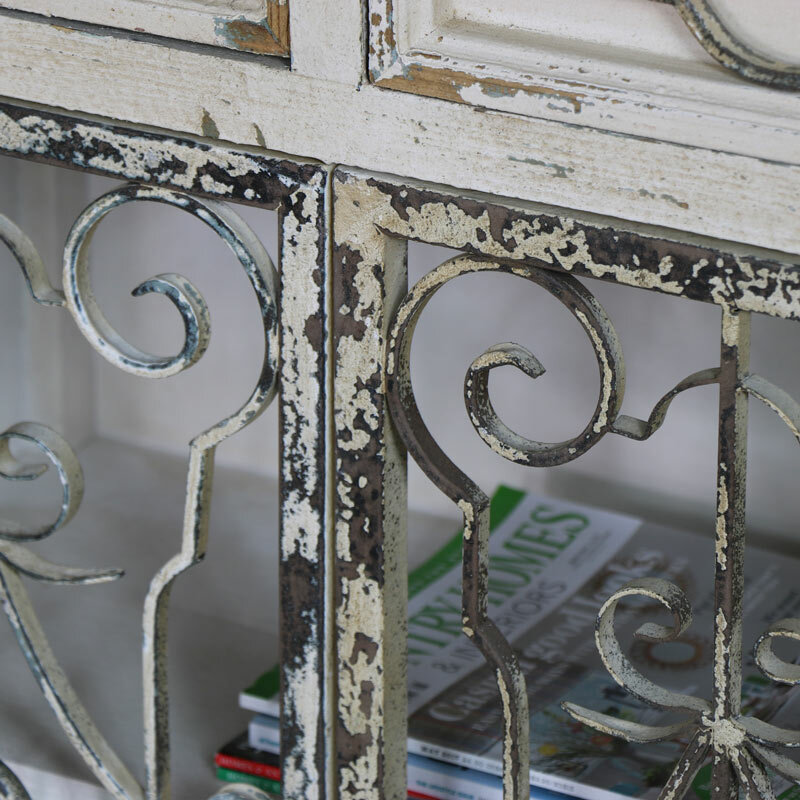 The distressed finish on this unit gives an aged feel that will fit comfortably into a country style interior. The drawers each feature a scrolled embossed carving that matches the cupboard front and flower shaped drawer knobs. 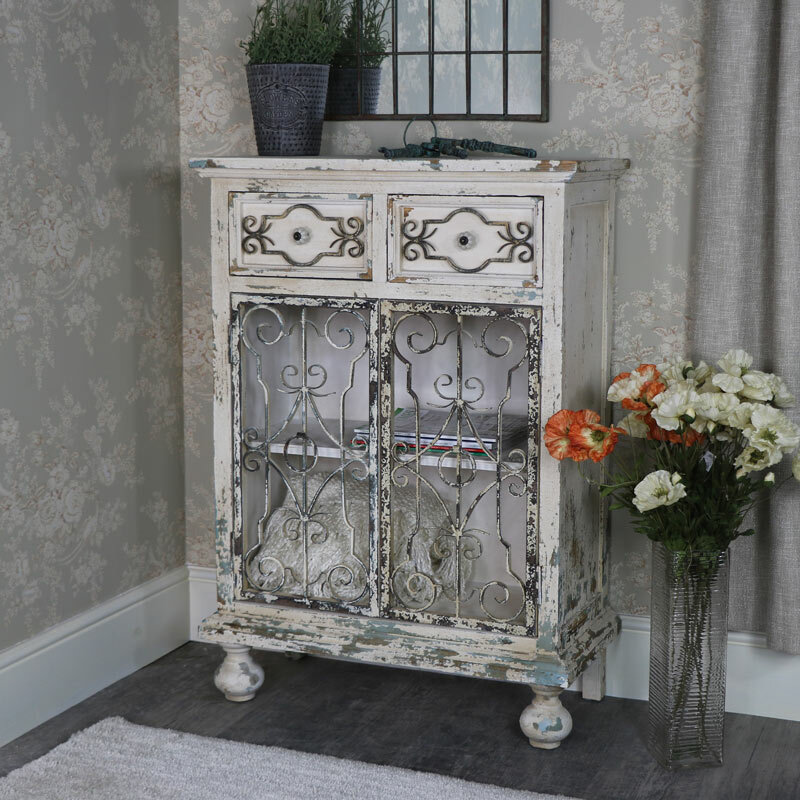 Add some shabby chic style to your home with this gorgeously rustic sideboard. Great storage in a vintage look that is perfect for the living room or hallway. A stylish cabinet with 2 drawers and cupboard underneath. The cupboard features an open metal fretwork design that complements the rustic charm and adds a loved homely look. 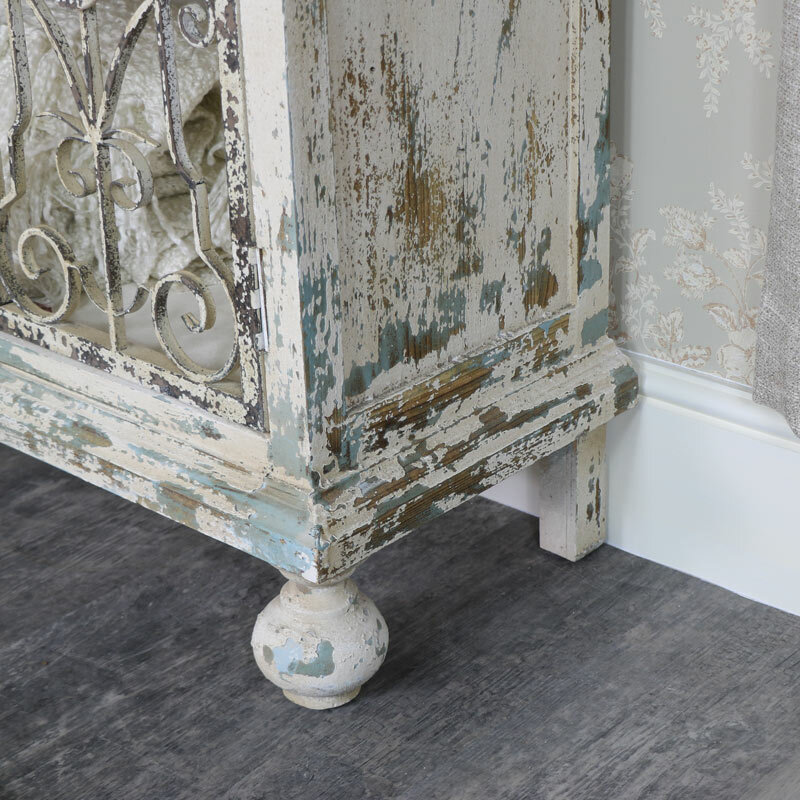 The distressed finish on this unit gives an aged feel that will fit comfortably into a country style interior. The drawers each feature a scrolled embossed carving that matches the cupboard front and flower shaped drawer knobs. Made from wood in a heavily distressed white painted finish. This unit comes fully assembled. The drawers measure 27cm x 14cm x 25.5cm and the cupboard measures 66.5cm x 28.5cm (width x height). A great addition to our extensive range of home furniture, with something to suit every interior. We have full ranges that will help to furnish your room from top to bottom to stand alone pieces that add that finishing touch.